Norah was born in 2014, and was rescued locally from Kanab, UT. She has really come out of her shell since arriving here, and is now an outgoing and social bunny. She is eager for greens and other treats from people. Her favorite activity is sitting on top of the box in her run and greeting everyone who walks by. Norah is definitely a lap bunny; put her on your lap in a calm environment and pet her, and she may just fall asleep cuddled up with you. Most rabbits do best with a buddy. Our rabbits are no different and the majority of them are deeply bonded with one or two other rabbits. We do require that bonded pairs are adopted together. 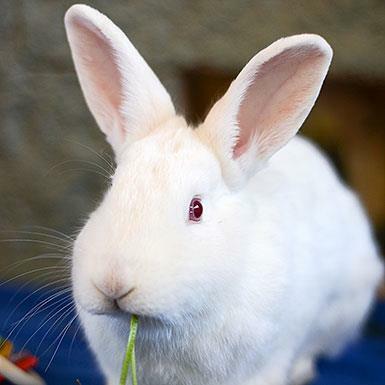 If you find a rabbit you are interested in adopting we will be happy to tell you whether or not they have a partner. You can contact us at rabbits@bestfriends.org for more information. Thank you for your interest in adopting!